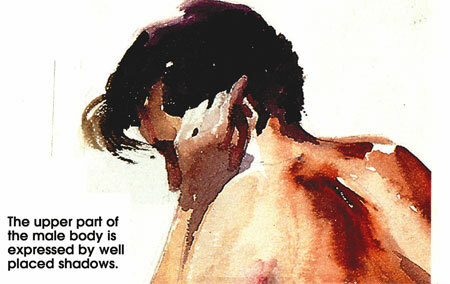 The human figure is one of the greatest challenges that a watercolourist can talk on, not only because of the subject itself, but also for what can be done with watercolour techniques. With other pictorial themes a watercolour can have some limitations. However, with figures exactly the opposite occurs. The subject requires a lot of rigour starting ofcourse with the initial drawing. It is important to bear in mind that the outline of the drawing is the base of the colour. Therefore, when doing the drawing it is necessary to constantly keep in mind the painting process. As we have seen all the elements of nature can be synthesised from others which are simple. To illustrate this we are going to look at the construction of a hand. This is one of the most complicated parts of the body to paint. However, as you will see, with a good drawing the proportions and the fundamental anatomical forms can be perfectly shown. You will observe the initial sketch has the task of laying the most elementary and simple outlines before filling them in with colour. These outlines have to be expressed in straightforward lines and at the same time they have to fill. To draw this hand observe the interior spaces, the inclination of each of the lines and the distance between them. The advantage of starting with such a simple sketch is that the corrections to the outlines are also easy. Almost all artists have an eye for a beautiful body, but not many beginners have the opportunity or perhaps the confidence, to attend a life drawing class to learn the skill. If this applies to you, do not worry. There are other ways of learning how to sketch and paint the human figure. The female form is the one most used, published, drawn and painted. The male frame, in comparison, is rather plain and not nearly as curvaceous. To start with you may refer to photographs or magazines and observe the moving body. It is important to fix in your mind the basic shapes of the front and the side of a body. Study the upper part of a male shown in the second picture. When superimposing tones or planes, synthesis or summary should be the main objective of the watercolourist. A lot can be expressed by well placed shadows. 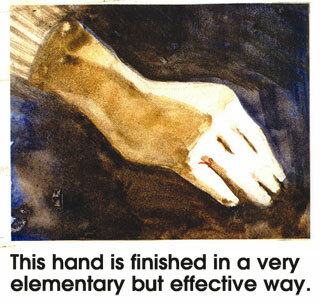 Therefore, to paint the hand the fingers are not drawn. This part is resolved with the dark shadows that surround the illuminated area. The back of the hand is shown with a slightly bluish burnt amber. The fingers are defined by the hair and by the shadows of the face. You will observe that I have used only one colour, burnt amber, to paint the upper portion. Sometimes it is difficult to imagine the result of a colour on one another, above all, when it is a question of several layers.